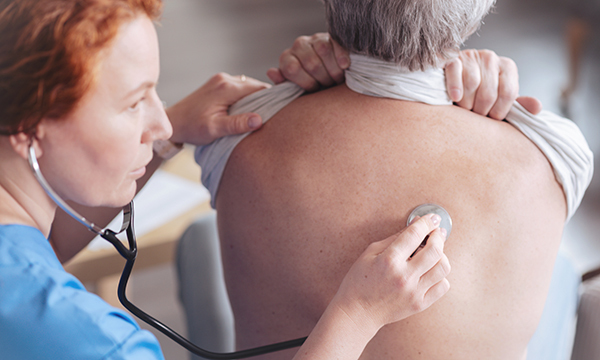 A nurse-led service has reduced hospital deaths from community acquired pneumonia (CAP) – and could be used to ease winter pressures in the NHS. The specialist pneumonia intervention service screens acute medical admissions for CAP, which is the leading cause of hospital-based mortality. A five-year study by University Hospitals Leicester NHS Trust found the death rate from CAP fell in the first year of the service, and further still in the second year. Researchers are now recommending the specialist service be adopted across the health service, saying it has the potential to save thousands of lives each year. The service consisted of two specialist pneumonia nurses working at Glenfield Hospital and Leicester Royal Infirmary during daytime hours. Confirmation of CAP by chest X-ray. Researchers found the overall death rate from CAP within 30 days of admission fell in the first year of the service from 23% to 17%. By the second year, the rate had halved to 11.5%. The service has now been expanded to five nurses with the hope of it supporting medical emergency teams during winter months. Its results were presented to the British Thoracic Society Winter Meeting today. Trust pneumonia nurse specialist Julie Skeemer said: 'We can help spot the signs earlier, which ensures no time is wasted for pneumonia patients but also for other patients as medical time is used more effectively. Consultants can treat other patients. A six-week follow-up X-ray clinic is part of the service, allowing patients to go home feeling reassured, she added. Pneumonia and flu caused 269,313 emergency hospital admissions in the UK in 2016/17, costing the NHS an estimated £1 billion. Is high-flow nasal cannula therapy feasible for managing bronchiolitis in ED?